Management at Lyco Mfg. has been involved with cooking and cooling food products for 50 years. The industries we serve include the Canning and Freezing of vegetables, Dry Beans and Prepared Meals. Prior to 1988 the heating and cooling of pouched products was done mostly on belts for heating and cooling applications using water deluge systems. Manufacturers of film for pouched products have traditionally recommended belts as the only way to heat or cool pouched products. Their motive for doing that was because inferior film could easily fail and develop leaks. Customers tell us that they would rather find defective pouches before they leave their factory than reach their customers. 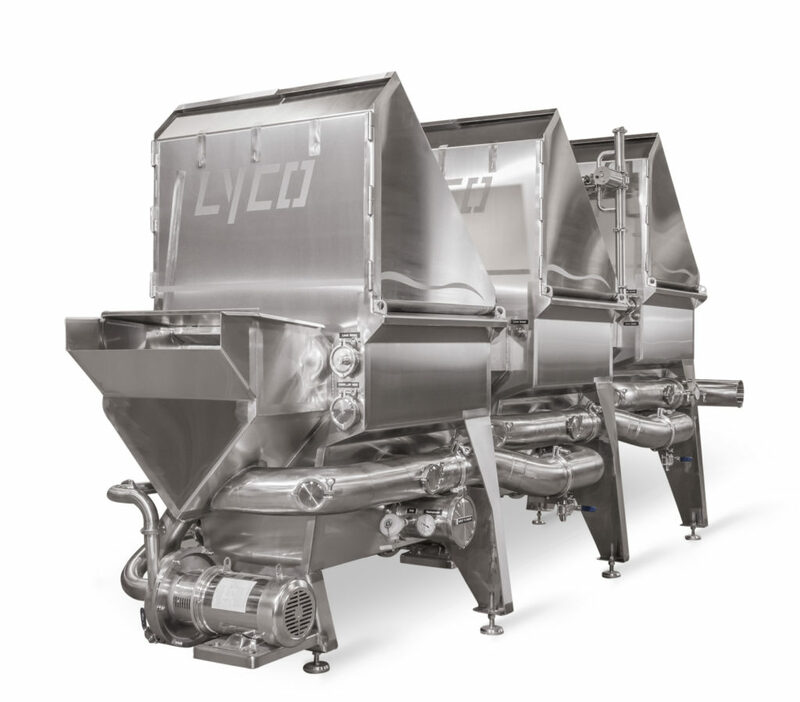 Lyco destroyed the myth that pouch processing had to be done on belts when they started heating and cooling pouches in their rotary drum machines. We knew that the most efficient method of transferring heat was submerging an item in hot or cold water. We discovered that gentle agitation reduced cooling times by 40% to 50%. We can use gentle mechanical agitation with robust pouch material. For more fragile pouches we developed a patented process called “Hydro-Flow Agitation” which uses water to keep pouches held in suspension gently rolling around. Either method treats pouches the same and can achieve the same final temperatures as cold as 40°F. or lower. 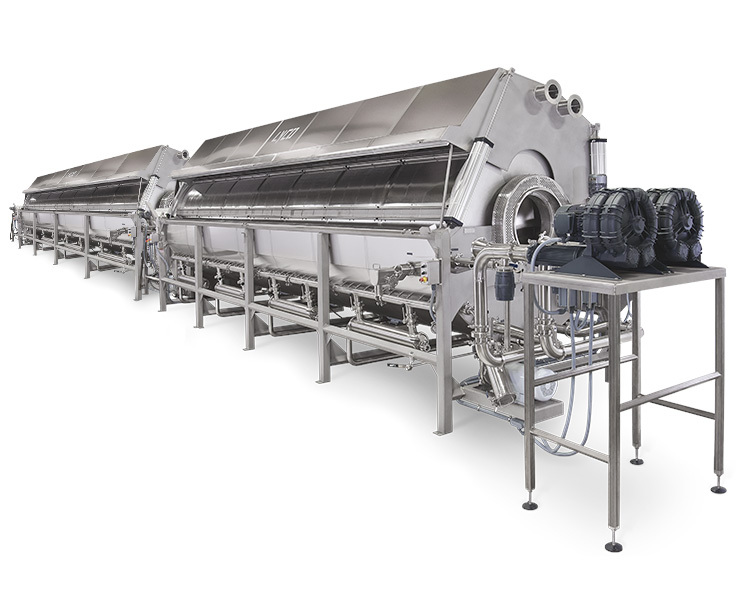 Lyco rotary drum pasteurizers and coolers take up much less floor space and use less energy than belts. One of our early systems was at a large State of Tennessee facility in Nashville in 1995 and has been running soup items trouble free for over 20 years. 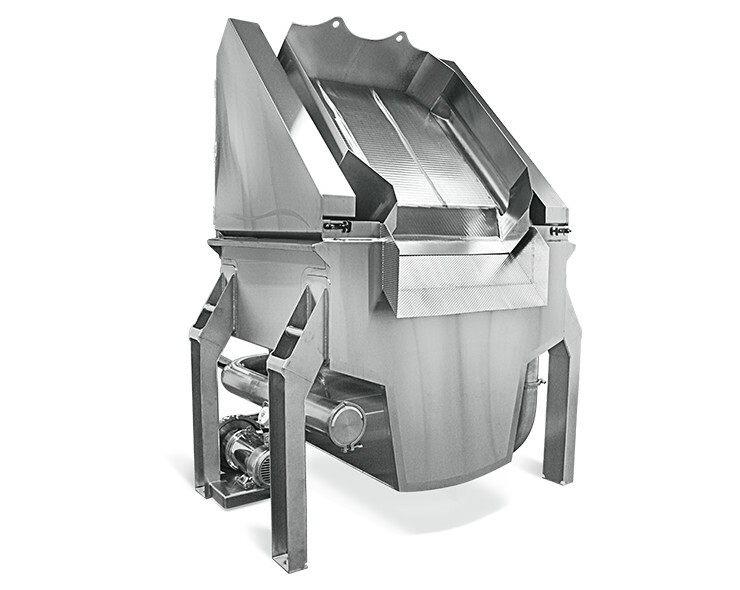 We have “Simulators” which are compact machines that handle products exactly the same way production size machines (up to 28′ long) do which accurately predict process parameters and new recipes. These machines are on a skid package that can be sent to your facility with technicians to test your own products on site. Prior to 1988 most pouch cooking was done on water deluge belts or spiral freezers. Chill-Flow™ Pouch/Tub Coolers are a variation of our blancher/cooker/cooler designs used for the first time 28 years ago for cooling vegetables. Today they are used for cooling many different pouch sizes of sauces, pizza sauce, chowders and soups. Pouches may be as small pack of restaurant ketchup or up to 5 or 10 pounds. 40°F. final temperatures are common requirements. 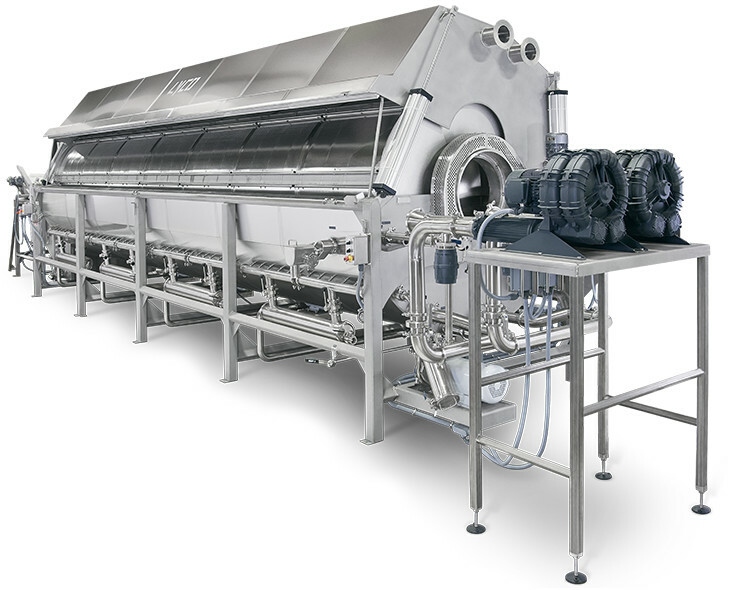 Submerged water cooling is the most efficient and economical method of cooling volumes of pouched food products. took 12 minutes to cook, but they could be cooled to 40F in 6 minutes,This machine is made in a single, 2, 3, and 4 zones. Each zone submerges and mixes product in cold well water (55°F.) or chilled (33°F.) water where it rapidly discharges heat. The machine will handle any particulate food shapes. The first stage can cool most products from 200°F to below 70°F in under 10 seconds. A second stage cools product to 55°F, and the third stage brings product temperature down to 40°F or below. This is a tremendous improvement in food safety and productivity. Process a wide variety of foods from pasta and dry beans to vegetables within a compact footprint — only 6 feet x 6 feet x 8 feet tall. Pre-cools in seconds ahead of freezing. The Iceberg works on all particulate foods and can handle up to 30,000 pounds per hour.